Are you seeking for new adrenaline fuels? If you are brave enough, then book a trip to Charlotte to take a ride on the brand new Fury 325 at Carowinds Amusement Park in North Carolina. Once the giga coaster opens on March 28, it will be one of the tallest, fastest and longest roller coasters in the world. The new attraction began construction on September 2014 as a part of a planned $50 million multi-year expansion at Carowinds amusement park. The coaster was officially announced by Carowinds on August 21, 2014 at an event that was held at the parks Harmony Hall Marketplace. Only a few days ago, Carowinds released a video showing off a stomach-turning virtual ride on the brand new Fury 325. The video provides a first-person perspective of the all-new extreme ride. Passengers will get into three open-air, steel and fiber glass 32-passenger trains, each made up of eight cars with four riders seating in a single raw. 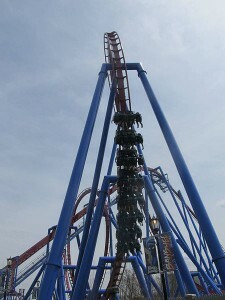 The roller coaster will have a capacity of 1,470 riders per hour. The track is 6,602 feet long and the ride will last nearly three and a half minutes. The train will take the riders to the top of the 325 feet lift hill, only twenty feet higher than the Statue of Liberty, then plunge them down at an unbelievable, near-vertical 81-degree drop, and a series of twists and turns, speeding up to 95 miles per hour. Get ready to face your fear!